When signs and symptoms fail to provide concrete evidence, doctors often prescribe blood tests to determine causes and nature of diseases. Blood tests are common in the current day and age as they are a part of the routine health checkup procedures. While venipuncture or the procedure of drawing blood from the vein appears to be simple, phlebotomists have to take several precautions to ensure the safety of the patients as this is one of the most invasive procedures in healthcare. Procedures and guidelines have been created for phlebotomists to adhere to, in order to prevent injuries and the transmission of perilous diseases during blood sample collection. Phlebotomy technician programs are conducted with the goal to standardize the practice and educate prospective phlebotomists on health and safety practices. Planning in advance for any procedure is the most important activity and should be performed diligently at the start of a phlebotomy session. Technicians are required to check for the availability of all necessary equipment, tools, and medicines needed during the procedure. The area used for the procedure must be clean, devoid of noise, and well-lit. Whether working with in-patients or out-patients, optimal level of cleanliness must be maintained to avoid transmission of any infection during venipuncture. Quality control and application of safety measures is most vital in ensuring the prevention of the spreading of the infection. 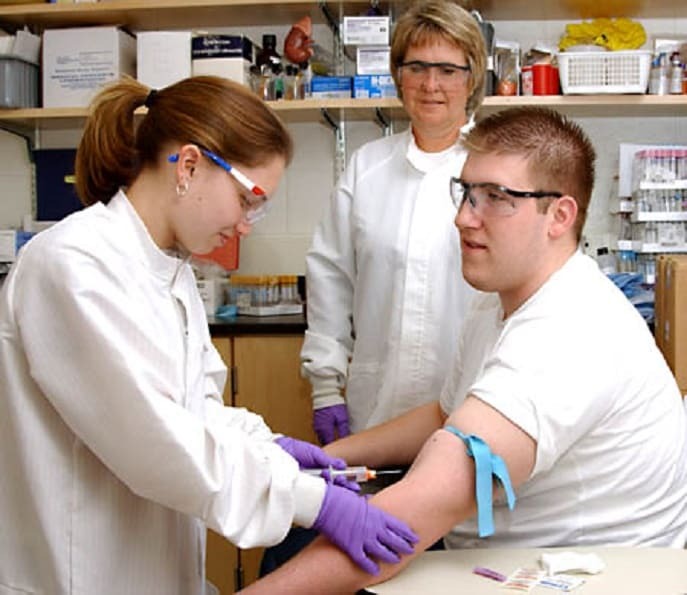 Students training to become phlebotomists are trained to understand anatomy, and the risks arising from blood exposure, and absence of infection prevention and control measures. SOPs are necessary to be followed at every step of blood sampling. The procedures are well-defined and made easily available to phlebotomists and other health workers at all times. The samples collected are to be stored in hygienic conditions to ensure accurate results of the laboratory tests. Samples must be labeled precisely to produce accurate results for patients. The results of laboratory tests need to be rightly identified with the patients whose samples were tested. A flawless system of identification and tracking is crucial in the delivery of correct test results. Blood samples must be safely transported for tests, as contamination of samples will not produce accurate results. Inaccurate results lead to wrong diagnosis, eventually resulting in the prescription of wrong treatment. All adverse events and cases of wrong test results, with precise details and identified cause(s) must be recorded as soon as the mishap is identified or noticed. Phlebotomists are expected to maintain high levels of hygiene to negate the vulnerability of patients and themselves towards infection and potential diseases. Hygiene materials like soap, water and alcohol rub, and well-fitting and non-sterile gloves must be used before, during, and post blood collection, and labeling procedures should be in accordance with the established safety measures. For optimal level of infection prevention among patients, phlebotomists must use single-use disposable sterile needles and syringes. WHO’s “My 5 moments for hand hygiene” approach can be used by phlebotomy experts to clean and disinfect their hands before every blood collection and storage procedure. Phlebotomists are recommended to use one pair of non-sterile gloves per patient. A single-use device or needle must be used per patient for blood sampling and drawing. For every extra procedure on the same patient, a new syringe is required to be used by the technicians. Patient’s skin must be disinfected without fail using 70% alcohol swabs, right before and after venipuncture is performed. Immediately post the collection and transmission of blood into blood-collecting tubes, phlebotomists must discard the used needle and syringe (treated as a single device). The sample tubes are to be placed in a study rack. Phlebotomists are to refrain from washing and reusing gloves and needles. The disinfected punctured site must not be touched with bare hands by phlebotomy technicians. Any accident that occurs must be immediately reported by the technicians, and they must at once seek assistance to start the post-exposure prophylaxis in order to prevent contamination. Phlebotomy technicians are advised to ensure high levels of hygiene and disinfection not just for patients, but also for themselves. Efficient judgment of the correct gauge of the needle by a phlebotomist is crucial in blood collection procedures, and more importantly in preventing injuries to the patients. The technicians are trained to be skilled at controlling the amount of vacuum applied when drawing blood and doing so without causing the veins to collapse. Training programs that impart theoretical and practical knowledge are important as they make the students proficient in intricacies that make a huge difference when procedures are performed on patients. The allied healthcare industry is booming with high career prospects. Students aspiring to join the industry can source education and training from recognized organizations and become skilled healthcare professionals. With the rising need for healthcare, medical establishments will need to be served by skilled phlebotomy technicians who can bring in hands-on experience and exhibit job-ready skills.